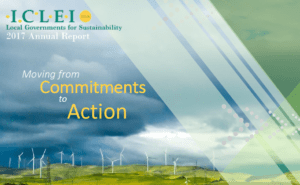 Data-driven decision-making on sustainability is front and center in this report. During the conclusion of a year that brought continued signs of and warnings about the effects of carbon buildup in our atmosphere, we pause to celebrate the work of ICLEI USA cities and counties — including 41 new members in 2018. 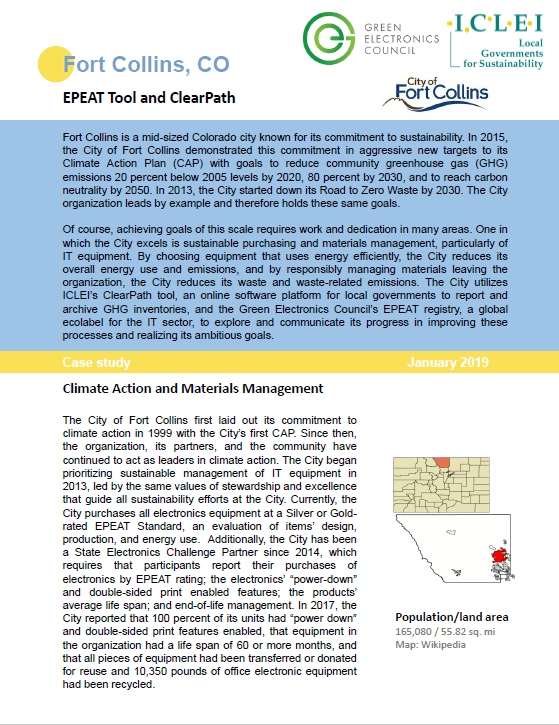 EPEAT and ICLEI ClearPath are utilized by the City of Fort Collins, CO, to achieve sustainability goals set forth in a Municipal Sustainability Action Plan. 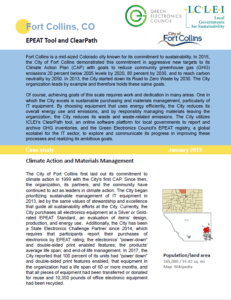 EPEAT-Registered IT product purchases have resulted in quantifiable environmental benefits, significant cost-savings and public recognition, while ICLEI ClearPath enables Fort Collins to develop greenhouse gas inventories, forecast scenarios, visualize climate action plans, and track progress. 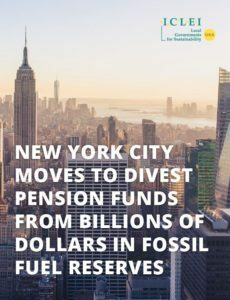 ICLEI USA and the New York City Mayor’s Office released a this case study at Global Climate Action Summit 2018, detailing why and how NYC has begun to divest billions of pension fund dollars from fossil fuels. This case study is the first in-depth look at this decision since Mayor Bill de Blasio made the announcement in January. It aims to show peer cities, large and small, that the principles and processes behind fossil fuel divestment are transferable to nearly any location where the will to divest exists. Part of a collaborative series from over 30 organizations released in support of the Global Climate Action Summit 2018, this publication showcases the action of states, regions, cities, businesses, investors and citizens – and assesses the opportunity for even greater impact. These actors have the potential to reduce global greenhouse gas emissions in line with the Paris Agreement. We focus on U.S. cities and counties to understand the interplay between local, state, and national action as well as their contributions to national and global efforts to reduce emissions. 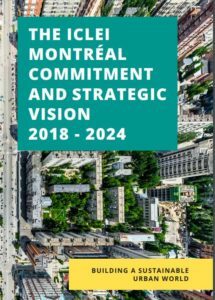 At ICLEI World Congress 2018 in Montréal, local and regional leaders rallied behind the ICLEI Montréal Commitment and Strategic Vision to guide them through 2024. It lays out five interconnected pathways for change, demonstrating their commitment to low-emission, nature-based, circular, resilient and equitable and people-centered development. Through these pathways, the ICLEI network transforms individual communities and collectively drives sustainable urban development worldwide. 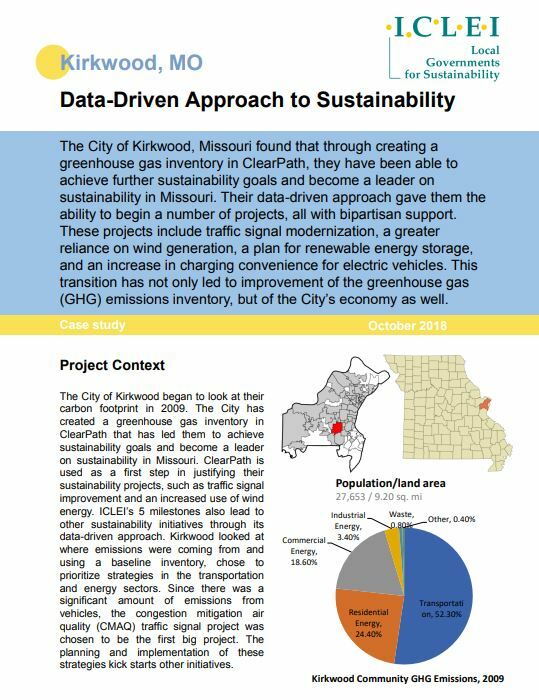 The City of Kirkwood found that by creating a greenhouse gas inventory in ICLEI’s ClearPath tool, they could advance wind generation, deploy EV chargers and bolster the economy — all with bipartisan support. 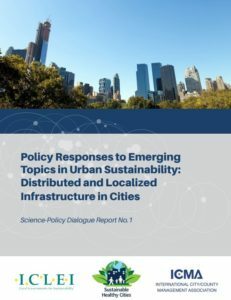 The localization and decentralization of key infrastructure systems — such as the intention to increase local renewable energy generation, decrease reliance on imported water, or increase local food production — has emerged as a potential strategy for helping cities achieve multiple sustainability outcomes spanning environment, economy, health, wellbeing, and equity. This document highlights Sustainable Healthy Cities network discussions from August 2017 to provide a implications for cities. 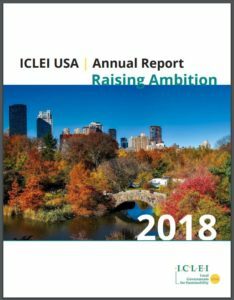 Released during key climate events in Boston in June 2018 — and on the heels of the one-year anniversary of the White House’s backing out of the Paris Agreement — our new report acts as a companion to the Localizing the Paris Agreement guidebook, showcasing how ICLEI USA cities are Moving Beyond Commitments to Action. 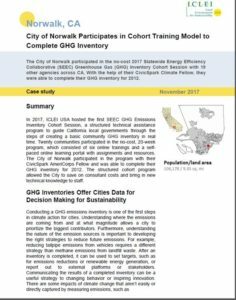 The City of Norwalk, CA, participated in the no-cost 2017 Statewide Energy Efficiency Collaborative (SEEC) Greenhouse Gas (GHG) Inventory Cohort Session with 19 other agencies across CA. With the help of their CivicSpark Climate Fellow, they were able to complete their GHG inventory for 2012. 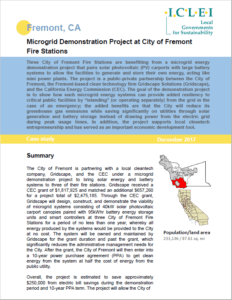 Three City of Fremont Fire Stations are benefitting from a microgrid energy demonstration project that pairs solar photovoltaic (PV) carports with large battery systems to allow the facilities to generate and store their own energy, acting like mini power plants. 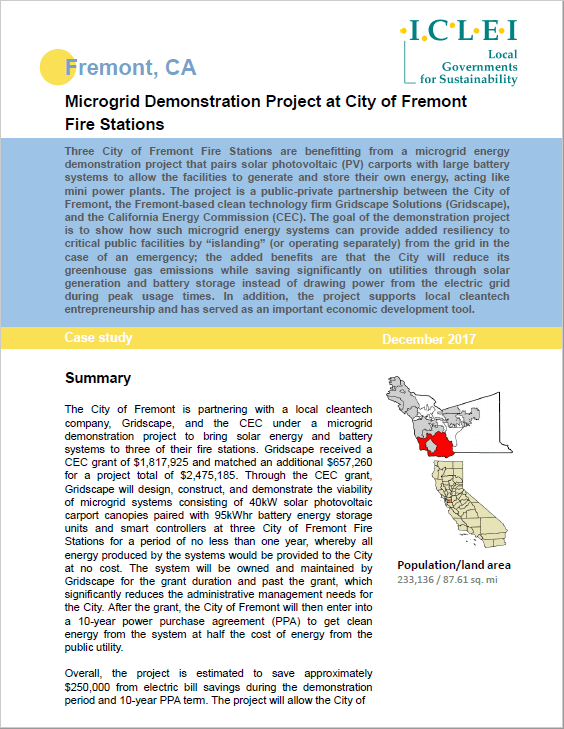 The project is a public-private partnership between the City of Fremont, the Fremont-based clean technology firm Gridscape Solutions (Gridscape), and the California Energy Commission (CEC). The goal of the demonstration project is to show how such microgrid energy systems can provide added resiliency to critical public facilities by “islanding” (or operating separately) from the grid in the case of an emergency; the added benefits are that the City will reduce its greenhouse gas emissions while saving significantly on utilities through solar generation and battery storage instead of drawing power from the electric grid during peak usage times. In addition, the project supports local cleantech entrepreneurship and has served as an important economic development tool. 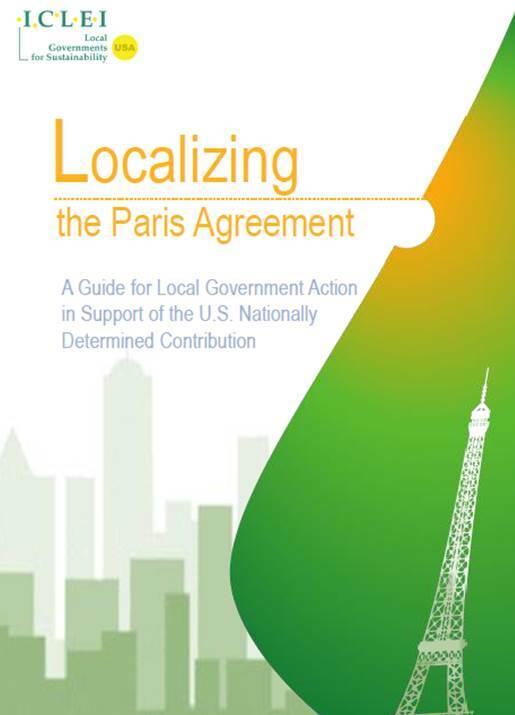 This guide is intended to help local governments go beyond pledges and move toward action on implementing the Paris Agreement. Focusing solely on the national policies that can uphold the U.S. Paris Commitment (or lamenting the lack thereof) fails to capture some of the most promising actions that can achieve demonstrable emissions reductions. Those will happen locally.